Lately when I’ve been eating out with my friend Joe, seems like we’ve been hitting new locations of old favorites. 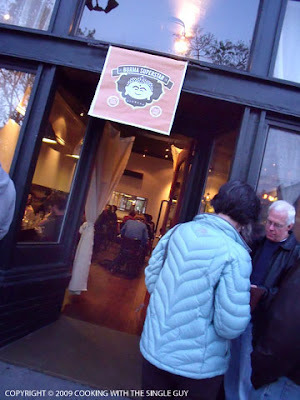 First it was Pizzeria Delfina’s larger California Street location, and this past weekend it was checking out Burma Superstar’s week-old location in my Temescal hood. This star of Burmese cuisine has a slick new look on Telegraph Avenue, which for a few months was the home for an American comfort food joint. What’s funny is that even though Burma Superstar remodeled the place and added all new furnishings, the feel still screamed out American bar rather than Southeast Asian ethnic restaurant. 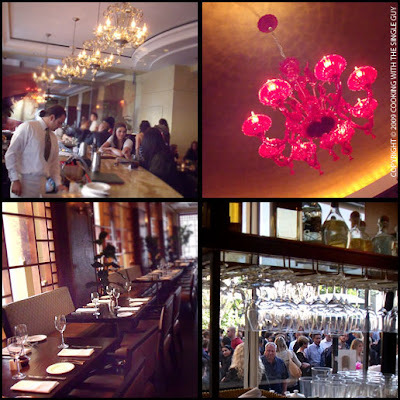 Despite the sterile surroundings, I liked the fact that this space gave you more room to breathe and enjoy the food and company. 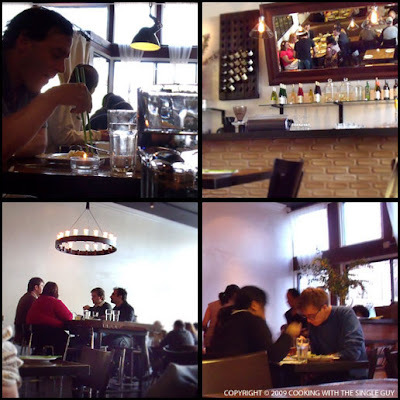 It’s just as noisy here as in the city, but at least you don’t have to squeeze past other diners. I noticed that the menu seemed limited, listing mostly the popular standbys from the original location but not much else. Hopefully the menu will expand as the kitchen gets more comfortable in its new space. We started with the Rainbow Salad ($10.25), which on the menu states that it was featured on a Food Network show (not sure which one, my guess is that it wasn’t “Diners, Drive-ins & Dive”). I mostly ordered it because I’ve already tried the often-ordered Tea Salad and wanted to try something different. 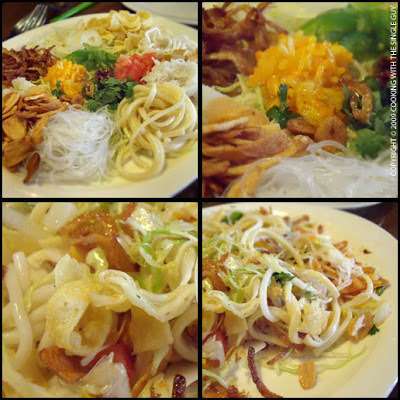 Like the Tea Salad, the Rainbow Salad is made with a variety of ingredients and then tossed at your table. Burma Superstar supposedly makes its Rainbow Salad with 22 different ingredients, but both Joe and I lost count when we were trying to listen to the server explain each ingredients. I do know that there were several different types of noodles and this really pretty scoop of saffron rice. The salad was dressed with a tamarind sauce, and it was light and refreshing but nothing spectacular. The ingredients lacked the pungent flavoring you get from the Tea Salad, for example, but I did like the light tamarind sauce. 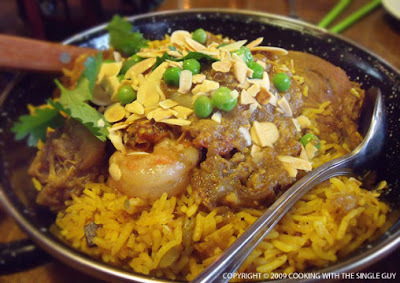 An unusual-sounding dish was the Classic Burmese Chicken Casserole with Cardamom Cinnamon Rice ($15.75), made with shrimp and cooked in a claypot. When it arrived, Joe commented that it looked like Burmese paella. The chicken was tender, but the dish was aching for some sauce. With the chicken and rice, it really seemed dry. Overall, the flavoring was more subtle than most dishes I’ve had at Burma Superstar. The rice included fresh pods of cardamom seed, which I’ve never eaten before (I’ve had it as a flavor for ice cream or tea, but never in its natural form). 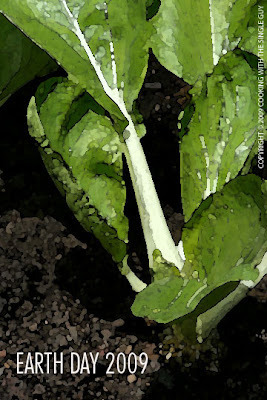 I have to say, while it embarked a floral essence that was unusual, the initial bite is a bit off-putting and herb-like. I don’t know if it’s that smart to include whole cardamom pods in rice. Also, the specks of cloves in the rice weren’t that fun to bite into either. Our final entrée was the Pumpkin Pork Stew ($14.75). We actually wanted to order a curry, but our server told us that the casserole would carry the same flavor as most curries so it would be smart to try something different. Oddly enough, the casserole didn’t remind me of curry at all, but the pumpkin stew looked like curry albeit less spicy. 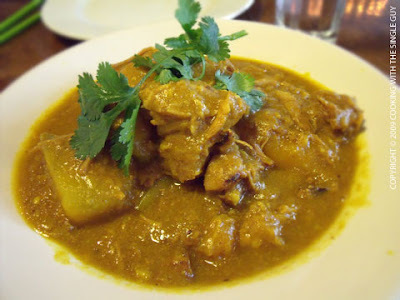 The stew was definitely tasty with tender chunks of pork with pumpkin and potato pieces that were cooked perfectly. If spicier, I would definitely think this was pumpkin curry. Side note: Service was efficient and not scattered like you sometimes experience at newly opened restaurants. I guess that’s a testament to Burma Superstar’s experience with running restaurants. But despite the efficient service, everyone we encountered that night seemed a bit robotic. They weren’t engaging or friendly. They were just there, which to me seemed like an odd note to strike for what should be a neighborhood restaurant. We capped off our dinner by sharing the Black Rice Pudding ($8.50) with ice cream and strawberries. 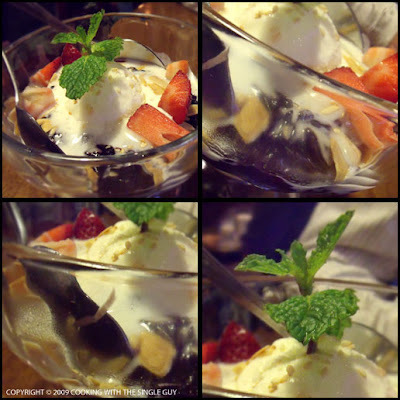 The pudding was very warm, so that made the ice cream melt quite fast. While the rice had a nice sweet taste, it wasn’t overly sticky or mushy like you would expect when you read the word pudding. It was slightly al dente, which seemed odd. Overall, I think everyone’s excited about Burma Superstar arriving, especially Joe who’s big on takeout (what’s funny is that there weren’t any takeout menus available at the door). The kitchen was able to transfer its quality cooking from the original location to this new spot, and I definitely think the space has a hip vibe that gives it a nice appeal. If they can make the service more pleasant and possibly add more variety to the menu, then this location may do better than the original Burma Superstar. So lately I’ve been on a craze for Korean food, but my Korean food is limited really to just kim chee and BBQ chicken. I really don’t venture beyond that because a lot of Korean dishes are heavy on the beef — except for soon, the tofu soup, which I also crave. Recently when I was shopping in a Korean grocery store in Oakland, I saw these really cute pickle cucumbers and that prompted me to make some Korean pickled cucumbers. This is also one of my favorite things about Korean food. Pickled cucumbers are a common panchan, which are the free side dishes that come out at Korean restaurants before your main meal. I’ve had a variety of Korean pickled cucumbers, some made more spicy than others, and some more crunchy than others. But my favorite has to be from my go-to Korean fast-food spot in Hawaii called Yummy’s. Their cucumbers are always so crunchy and not overly spicy, with just the right balance of sweet and sour. In the past I’ve tried to duplicate this at home, but always failed. Now I realized it’s because I wasn’t using the right cucumbers. Apparently, it makes a difference using these small pickling cucumbers because they really retain their crunchiness even sitting in pickling juice for days. 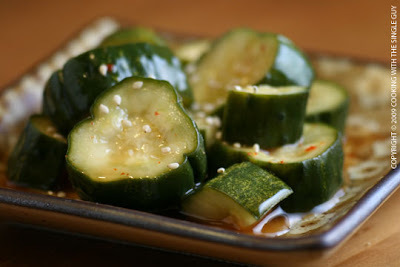 Below is my recipe for the pickled cucumbers, Korean-style. Enjoy! Cut cucumbers about ¼-inch thick (leaving on the skin) and sprinkle with kosher salt. Gently work salt through the cucumber pieces with your hand and let sit for 30 minutes. Then rinse quickly under running water and drain in colander. In a large bowl, mix together sugar, vinegar, water, fish sauce, ginger, garlic, chili paste and chili flakes. Add cucumbers and then transfer everything into a clean mason jar. Refrigerate until ready to serve. Makes about 3 cups of pickled cucumbers. 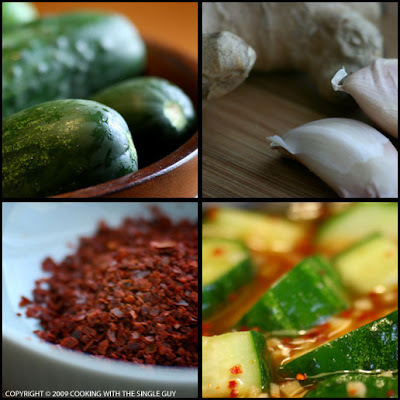 TIP: You have to use small cucumbers designed for pickling to really get that nice crunch. Normal cucumbers might be crunchy at first, but will eventually soften. The pickled cucumbers are often found in Asian grocery stores, especially Korean and Japanese stores. In other gourmet stores, they may already be pickled. HOT SAUCE: The Korean chili paste, aka kochujang, is a common ingredient in Korean dishes. They’re sold in plastic containers and has the same consistency as miso paste, but spicier of course. Check Korean grocery stores or a general Asian grocery store. I’ve never purchased it online, but if you’re desperate to try you can go to KoaMart.com out of L.A. 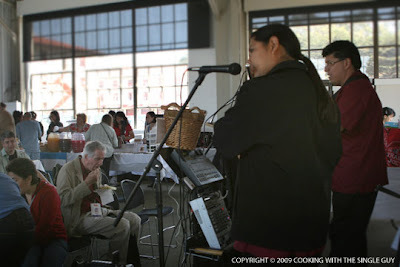 I got my fill of tamales yesterday afternoon at the Third Annual Taste of Tamales by the Bay at San Francisco’s Fort Mason. A variety of tamales was served up by local restaurants, and it was a good thing I got there early because, as usual, these tasting events get crowded by the minute. 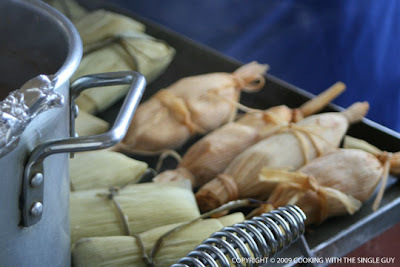 I don’t generally eat Mexican food, but I do love tamales—what I consider Mexican comfort food. It’s made with a corn meal called masa and often filled with meats or vegetables like sweet corn (my favorite), and steamed inside a corn husk. 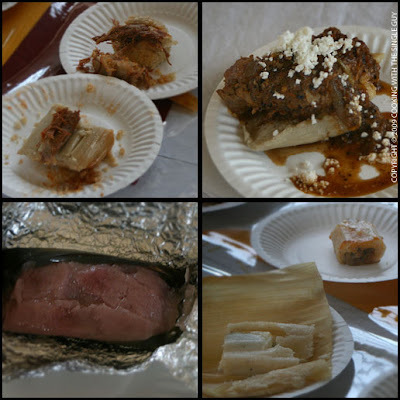 The restaurants that turned out to showcase their tamales varied from the really fancy restaurants to caterers. 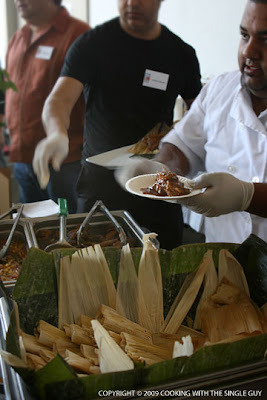 My favorite tamales came from Cocina Poblana from Oakland’s Jack London Square. They actually made unfilled tamales and then served tender pork on top with sauce and a sprinkling of cheese. I’ve never had tamales served this way, but it was great. There were some odd tamales, like one stand that was selling sweet tamales. Now, earlier I had a tamale from La Espiga de Oro from the Mission District that was made of sweet corn and it could have passed for dessert. But at this other stand, they had tamales made with strawberries, chocolate and peaches. Thing is, you didn’t actually get the bits of fruits, but instead just got a tamale flavored with fruit-flavored syrup. I wasn’t a fan. 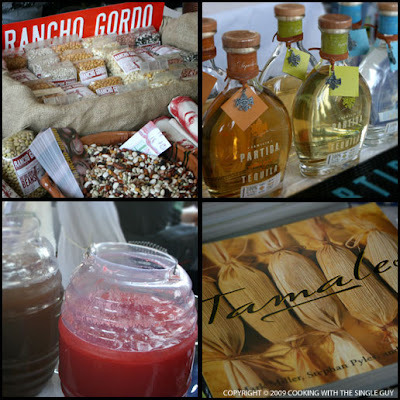 It wasn’t a big event, but as people munched away at their tamales, they listened to Mexican music and you could stroll and check out some craft booths selling Latin-inspired jewelry or cookbooks. I checked out the tequila booth from Partida and they had three versions of their tequila that varied depending on how long they were aged. The girl there was so funny because she kept pouring tasting cups that were like shots. (Not really, but pretty close.) So I felt a bit drunk by the end of the day. 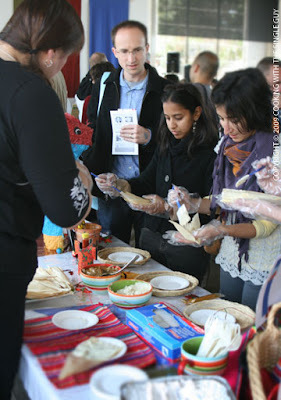 There was also a section where they taught people how to make their own tamales. It really looked a bit messy to make, so I just stuck with standing in line for the ready-made tamales. 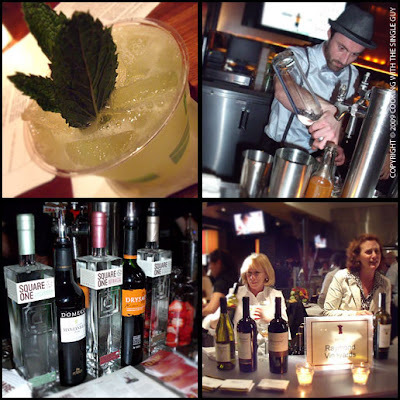 A fun and entertaining part of the event was “Margaritas Rock!”, which was a competition for the best margarita. 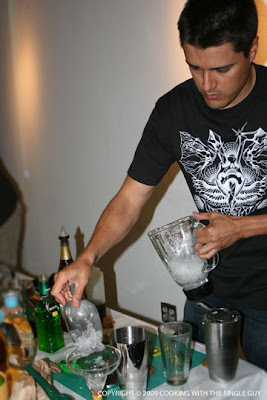 Amateur and professional bartenders competed in several rounds. 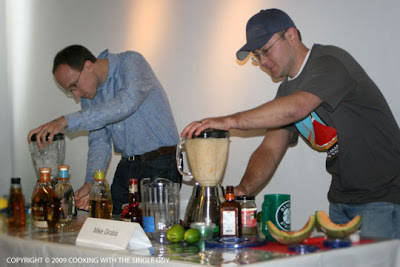 I don’t know who won because I didn’t stay till the end, but I caught the first round and watched these guys make up their own signature margaritas with ingredients like cantaloupe, Midori liqueur and Fresca. I tried one afterwards and it had sooo much alcohol. I didn’t realize there were so many tamale lovers, but it’s nice to see this Latin classic get an event all to itself. Sugar Cane ... Is This Hawaii? 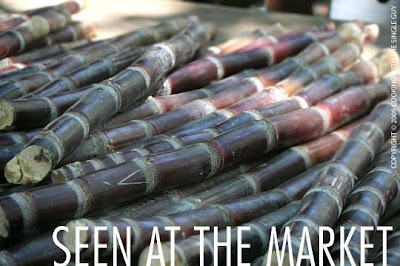 I'm always surprised when I see them at the farmers' markets in the Bay Area because I wonder where does it get so hot that they can grow sugar cane regularly? (I know we had super hot weather last week, but sugar cane thrives in consistently hot weather.) I spotted these stalks at an Asian stall at the Civic Center Farmers' Market this morning, sold for $3 each. I wonder who knows what to do with them, other than a natural sweet treat for kids? 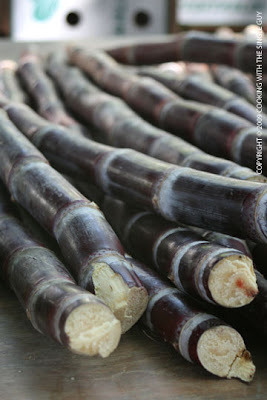 A year ago a reader emailed me asking where she can find sugar cane stalks. I forgot why she was looking for them. 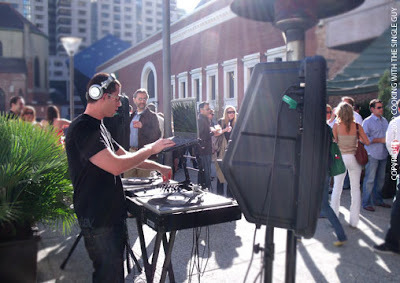 But if you're still reading my blog, head down to the Sunday Civic Center Farmers Market in San Francisco and you can find them there! The Giants are out of town, but if the players were anywhere near their lockers this past Thursday night at AT&T Park, training regimens and fitness diets would definitely be out the door. That’s because the Field Clubhouse—just a few steps down from the players locker room—played host to notable chefs from around the city for the Share Our Strength’s Taste of the Nation. 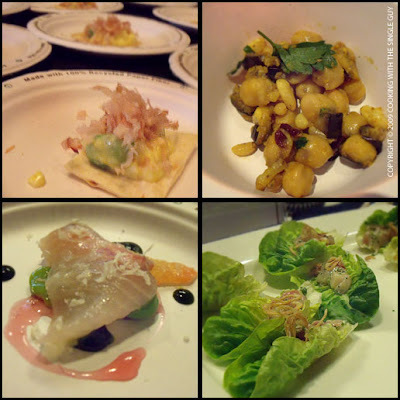 The event was a two-parter: 1) a tasting event that ran from 6 to 8 p.m. at the clubhouse, and 2) a sit-down dinner at the nearby Acme Chophouse cooked by celebrity chefs like Traci Des Jardins, Michael Simon, Chris Cosentino and Gavin Kaysen. The two events all benefit the Share Our Strength organization, which helps fight hunger among children in the United States. I could only afford the tasting event, so my recap is focused primarily on that portion of the evening. But the exploration of the variety of mini bites was more than enough to keep me satisfied all evening. This is my first time attending this annual fund-raiser, and the tasting event didn’t have a real organized feel to the layout. Restaurants were spread all over and drinks were on one side of the room, but it would have been nice if restaurants were organized by “greens,” “meats” and “sweets” for example. Instead, I just ate whatever I ran into. One of the first bites I tried was this incredibly simple but tasty anchovy starter from Chef Staffan Terje of Perbacco. It was a cured local anchovy wrapped around a bit of farm egg and served with salsa verde. The local anchovy was meaty and flavorful, but not overly salty and it was balanced with the egg and salsa verde, which provided a slight acidity for balance. I admit I came back for a few more of these silvery slickers. Another really nice starter—also featuring a farm egg—was a fava bean salad by the chefs from Coco 500. It was conveniently served on a cracker and topped with smoked bonito, which added a complexity of taste to what sounds like a real simple dish. A Mediterranean pinto bean salad from Zaré at Flytrap was quite filling, and Bar Tartine’s crudo made with sustainable Kona Kompachi was excellent. It was served with a light horseradish and fava beans. Waterbar’s Parke Ulrich served an Australian Kingfish tartar that was nice, but the portion was overwhelmed by the little gem lettuce holder, which was not so little. 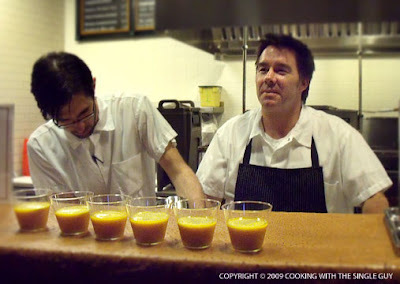 A very elegant carrot soup was served up by Chef Mark Sullivan of Spruce. It was still warm when I got a taste, and it continued to warm you inside with the tumeric flavor and bits of dates and almonds. On the opposite end of Sullivan’s warm carrot soup was the gazpacho served up by Top Chef contestant and Absinthe Chef Jamie Lauren. Lauren was also that night’s host for the tasting event, so she wasn’t always at her Absinthe station. 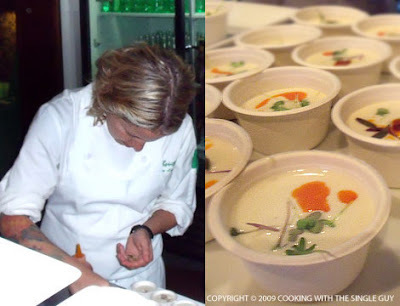 But here’s a shot of the top of her head as she’s focused on prepping her white almond gazpacho with a Point Reyes clam in the bottom. The cold soup was pretty, creamy, rich and tasty. 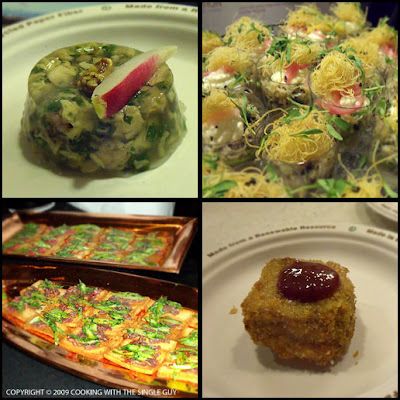 Some of the more substantial dishes included, of course, mini lamb burgers (you can always count on someone making mini burgers at a party), also from Zaré at Flytrap. 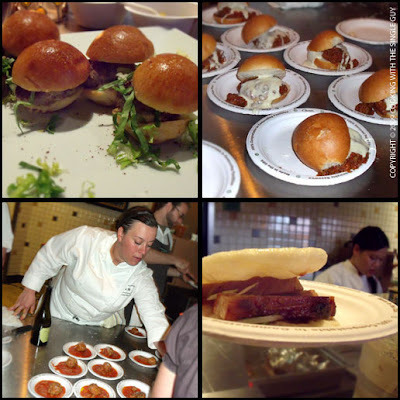 An interesting burger dish was the Pork Sugo Sloppy Joe from Chef Chris Behr of SPQR. True to its name, this Sloppy Joe was a mess to eat, but tasty. 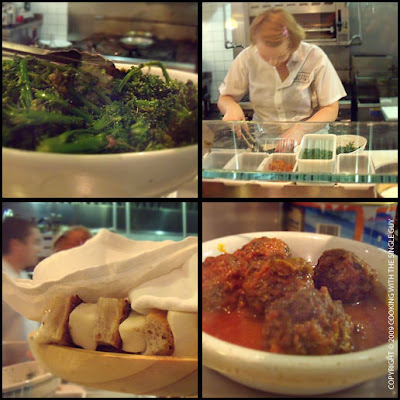 SPQR’s sister, A16, served up a traditional pork and beef meatball cooked up by Chef Liza Shaw. Offering a break from these Italian dishes was the pork belly buns (also kind of messy to eat but still tasty) from Charles Phan of Slanted Door and his new Heaven’s Dog. But also yummy were the beef carpaccio from the Ahwahnee Restaurant all the way from Yosemite and the crispy pork cake with strawberry and jalapeno jam from Maverick all the way from the Mission. There were several other bites that I tried, and some more successful than others. But by this time I was focused on the sweets, which were actually limited to only a few places. One place that went all out was Postrio and its chefs Seis Kamimura and Ian Flores, who offered up an array of dessert options from chocolate-layered cakes to truffles to meringues. 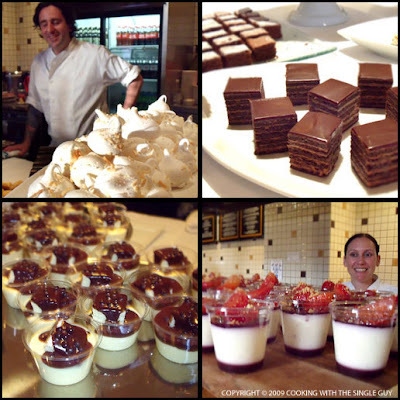 Scala’s was also nice enough to offer a dessert — an incredible Bostini Cream Pie, a mini play on a Boston cream pie. 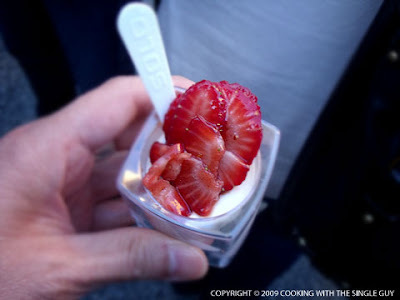 And Perbacco had one of my favorites, which was a pretty ricotta panna cotta with strawberries. 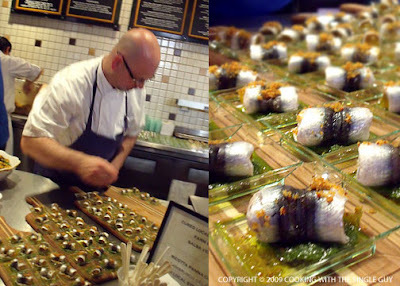 It was an impressive collection of chefs and food, and all for a good cause. It’s slightly ironic that to put the spotlight on hunger in America, we have to put on an almost decadent tasting event. But chefs cook, and bloggers eat. We each contribute what we do best as our way of helping — as long as we never forget those who can’t attend special events like this. One thing that seems to be bucking the economic downturn is pizza. 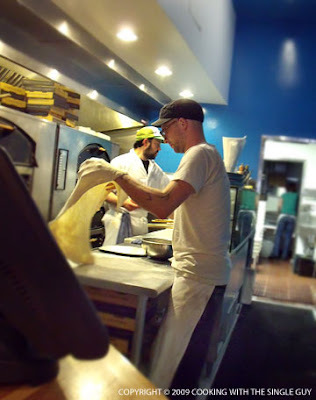 And that was fully evident when I visited Pizzeria Delfina awhile back with my friend Joe. 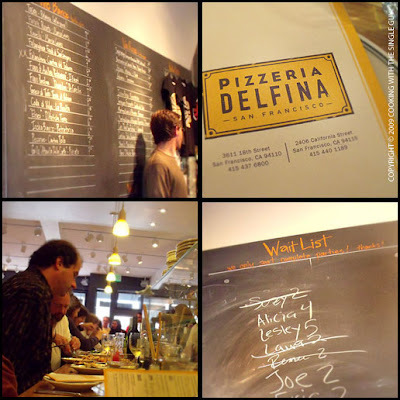 I’ve blogged about the original Pizzeria Delfina location in the Mission neighborhood, but this visit was to its second and newest location on California Street in the upscale Pacific Heights neighborhood across town. This larger location, brightly lit but still keeping with the funky flavor of the Mission spot, seems to be packed all the time. Joe and I arrived early for dinner on a Saturday night and there were already several names on the wait list. Luckily, our wait was only about 20 minutes because we were willing to sit at the long counter facing the prep stations. 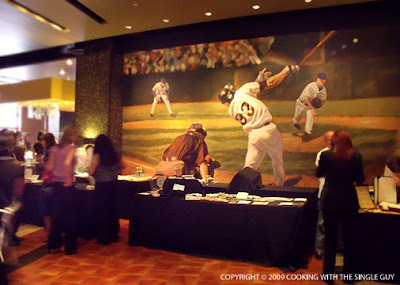 The counter actually was a dream spot for me because I could see the sous chefs preparing the dishes, such as the large salads and meatball appetizers. Off in the back was the pizza station where the pizza makers were busy prepping several pizzas for that night’s dinner rush. As we watched the chefs prepping the dishes, we noticed an interesting dish that looked almost like a long chunk of cheese. It caught both Joe’s and my attention, so we asked our waitress about it and she says it was the special appetizer of the day, “Mozzarella in Carozza” ($7). This was a skewer of mozzarella cubes and bread, pan-fried with a sprinkling of fresh herbs and served up hot. The edges of the bread chunks were perfectly crisp and the mozzarella cubes were oozing when I bit into them. I enjoyed this but I have to say I don’t think it was the same thing we originally saw. (I think what we saw was the “Panzarotti,” which was also a special appetizer.) Still, our Mozzarella in Carozza was excellent. Joe and I couldn’t decide on a pizza to share, so we each got our own. 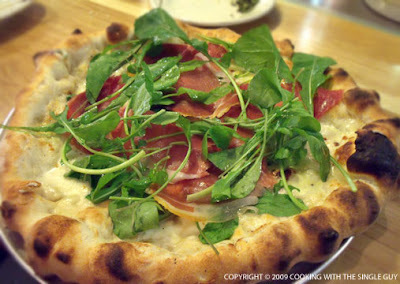 Joe decided quickly on the Clam Pie ($17) while I debated for awhile and ended up ordering the Prosciutto Pie ($17). The Clam Pie came out with a very thin crust but puffy edges, which is how I remember Pizzeria Delfina’s pizzas. The edges are always slightly burnt in certain spots, like evidence that this is rustic and homemade. I tried a slice of Joe’s Clam Pie and loved it. 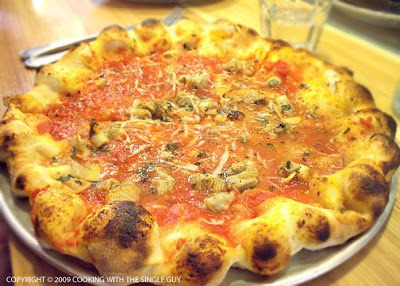 I couldn’t imagine a pizza with clams (for some reason I kept envisioning a pizza with clam shells on top), but the juices of the clams mixed in with the tomato sauce and were a brilliant combination. And while the center of the pizza can get soggy quickly, it was worth it. My Prosciutto Pie looked really pretty when it arrived, with the fresh prosciutto slices and arugula elegantly draped in the center. While all the ingredients were a classic combination, my Prosciutto Pie turned out to be harder to eat. The prosciutto slices and the mozzarella cheese didn’t stick together and kept sliding off the pizza. Joe, however, loved it. We both decided that we should have switched pizza orders because we each loved the other person’s order. After the pizza we were both pretty full, but I did want to try Pizzeria Delfina’s famous cannolis. Unfortunately, for some reason the cannolis never made it from Mission Street to California Street. This second location did not offer the popular cannolis on its dessert menu. So instead I got the affogato ($4), which is the only way I really drink coffee. Affogato is the traditional Italian dessert of a scoop of vanilla ice cream with espresso. It arrived in this unusual metal cup that looked strangely Moroccan to me. The espresso came separately and it was left up to me to pour as much of it as I wanted onto the ice cream. When I ate the affogato, there was something off about it. The coffee was way too bitter for me, and it wasn’t as enjoyable as at other places where I’ve ordered affogato. 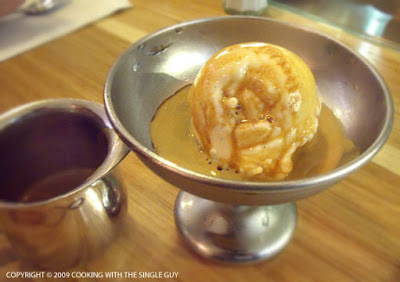 So one thing I realized about affogato -- the coffee makes it or breaks it. In this case, the coffee didn't live up to its potential. Despite the bitter coffee, I didn’t have any bitter aftertaste about my visit to Pizzeria Delfina’s second home. The pizzas are still nicely thin and filled with flavor and the menu of appetizers and salads seem to be more extensive than the Mission location. The only improvement I would say is to offer the cannolis here as well since it’s a signature dessert. Otherwise, this new location demonstrates the high standards of its owner Craig Stoll, and I’m sure Pizzeria Delfina will have no problems weathering the economic storm. Hot enough for ya? 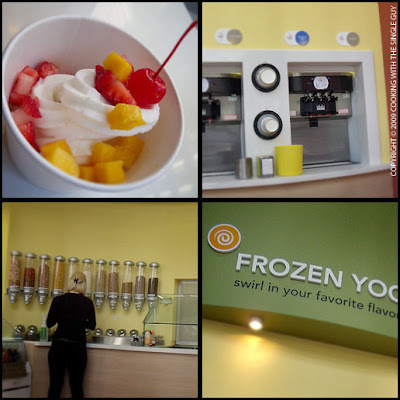 We’ve had record heat in the San Francisco Bay Area the last two days, so I’m cooling off by looking at some recent photos of frozen yogurt I had at Yoppi Yogurt in the city’s Financial District. The current warm weather reminds me that I need to get back into my fro-yo rankings. 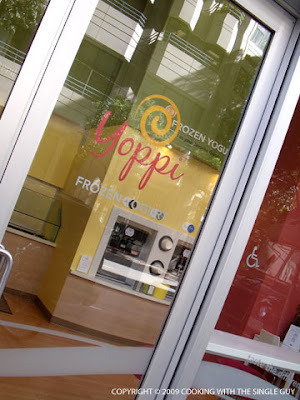 And I’ve never visited Yoppi, but read about it on Foodhoe’s Foraging blog. The problem is Yoppi isn’t open on weekends, so I had to check it out one day after work. The shop is pretty small in an office tower at the corner of Sansome and Clay Streets. It’s one of those self-serve fro-yo shops, so you pay by the ounce. My total came out to $3.62, which doesn’t sound so bad (it cost 46 cents an ounce). The yogurt itself was a bit tart when I first ate it, but after awhile I got used to it and I didn’t really notice the tartness. The texture is not as creamy as I’ve had from other places, but it wasn’t icy. It was kind of in the middle, which is kind of where I’m putting Yoppi on my rankings. It’s a decent cup of fro-yo that hits the spot when you’re on the go, but not anything I’d search out or spend a lot of time hanging out. 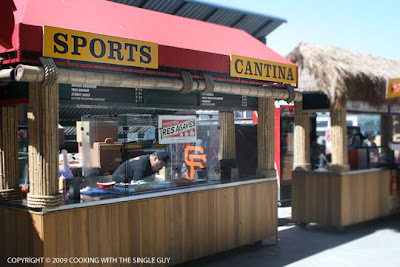 There’s not much new when it comes to food at AT&T Park, where the Giants play. Stands still flowing with garlic fries. People still chow down on corn dogs. I’m still avoiding the Crazy Crabs. But there was one addition, and that’s the restaurant Tres Agave, which has taken over the Mexican food carts that used to be run by Compadres. Tres Agave is a pretty popular Mexican restaurant just a couple of blocks from the stadium in SOMA. So I was interested to see what kind of game fare they were offering. 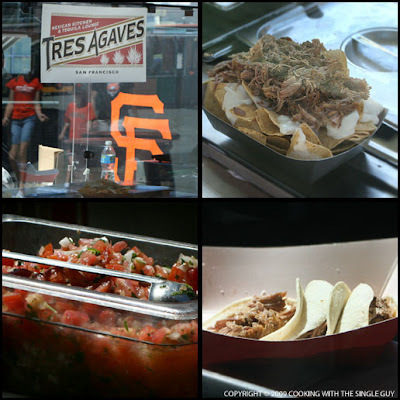 The Tres Agave cart can be found on both the promenade and view levels (and possibly the Club level, but I couldn’t get in to check myself) and sells things like street tacos and humongous nachos topped with carnitas. But I got the chicken tamales (they also have vegetarian) because I love tamales. 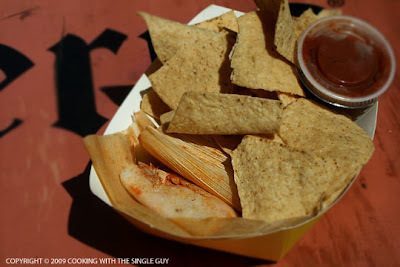 For $6.50, you get a tray of two tamales and a whole lot of chips. The thing about the tamales is they’re tiny like baby tamales. I think they were maybe 6 inches. Can you even see them in the tray that was overflowing with chips? The tamales were decent. It was basically cornmeal and chicken. The sauce that came with it improved the taste, but I saved much of it for the chips because I don’t like eating chips without salsa. 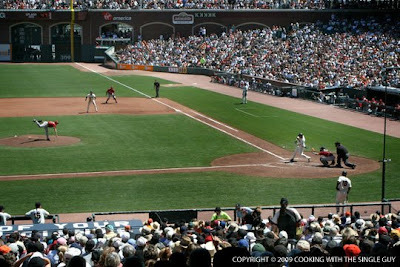 After a few innings in the heat, I had to get up and walk around and feel the breeze of the bay. So I ran into another Tres Agave cart and this time I tried their bacon-wrapped hot dog ($6.75). I know, you’d think by the sound of this that this item would be the most popular thing at the stadium. 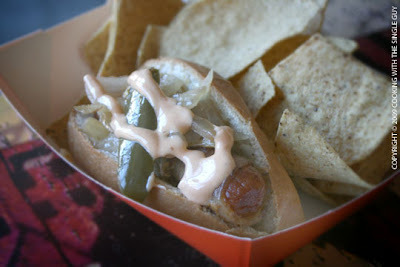 The hot dog came with grilled peppers and onions and then drizzled with some kind of sauce, kind of like chipotle. Again, the tray was overflowing with chips. Tres Agave might be selling fancy Mexican food, but I’m really disappointed at the portion size. 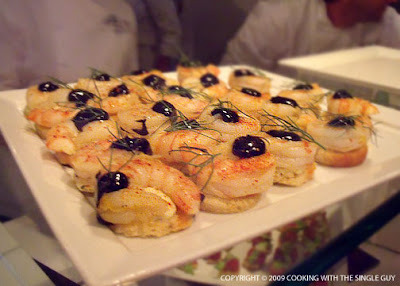 It’s almost like those catered parties and these were the perfect portions for finger food. After the tamales and hot dog, I had to get a frozen lemonade just to survive the rest of the game in the heat. Luckily, it was a game worth watching since the Giants beat the Diamondbacks, 2-0, behind pitcher Randy Johnson (who used to play for the Diamondbacks). Just 146 more games to go! 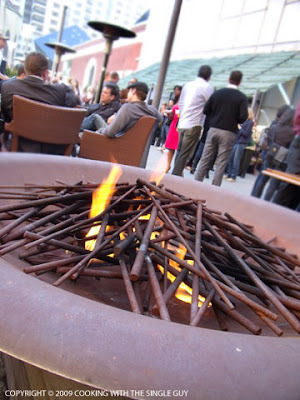 We’re just half-way through spring, but it’s been feeling more like summer in the Bay Area these days. 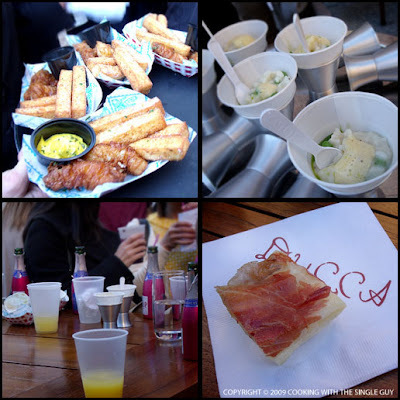 So it was perfect weather for Ducca’s “Bocce Ball and BBQ” event Friday night. 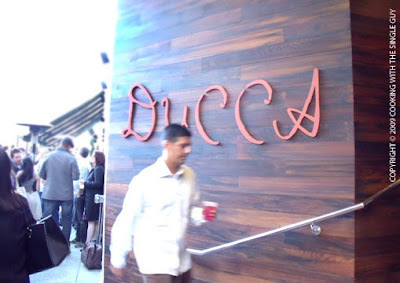 I wasn’t really clear what the party was for, but it seemed like another chance for free drinks and food from Ducca’s chef Richard Corbo, who was named a “Rising Star Chef 2008” by the San Francisco Chronicle. Grilling just screams summer, so seeing the big grill setup in the center of Ducca’s garden and patio was very exciting. Unfortunately, I never really got a taste of anything from the grill. For some reason, I kept seeing food being grilled, but none ever made it among the crowds. 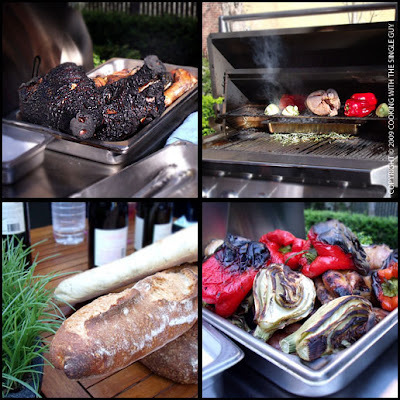 I initially saw blackened pig heads and then some grilled peppers and artichokes along with some whole chicken, but never got to taste them. 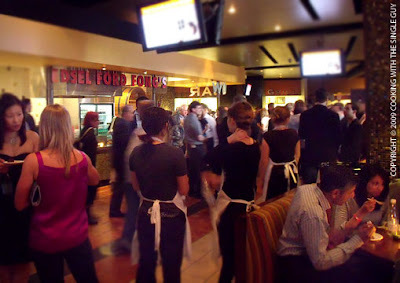 So some of the things I did get to eat where various appetizers circulating the crowd. There were house-made foccacia, one topped with carmelized onions and another with prosciutto and asiago cheese. (The bread was soft and thick.) Then there were cups of spring risotto, which had peas and was really tasty and warm. 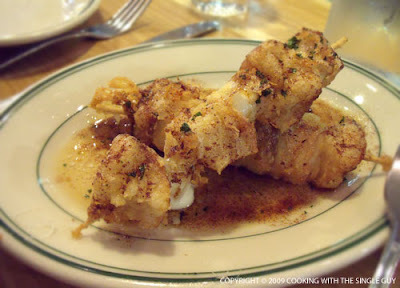 Of course, the most popular item was the deep-fried fish chips with fried polenta. I passed on the deep-fried tray, but everyone seemed to love it. I have to say my favorite bite was the one dessert item being passed out, and it was this panna cotta topped with strawberry. The panna cotta was so incredibly creamy with a nice vanilla taste, but I just couldn’t get over the texture. So rich and thick but still smooth. Only one tray came out early on and I was glad I grabbed one before I left. 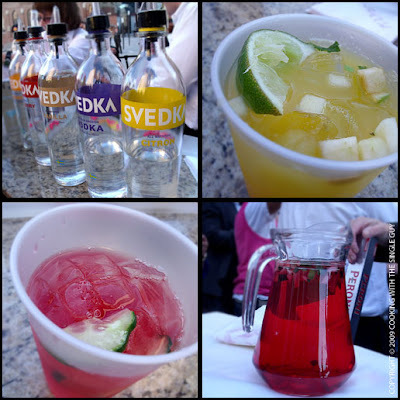 The drinks were hosted by Svedka vodka, a Swedish vodka I’ve never heard of. I think it’s new. Of course, they were pushing the flavor-infused vodka, which I’m not a big fan of but, hey, I’m willing to try any vodka that’s free. There were a few specialty drinks for the night, and the first I tried was the “Spring Cooler” made with vanilla vodka, cranberry juice and Triple Sec with a cucumber slice. This sounded really refreshing to me, and it was. The vanilla actually made the drink taste more full-bodied, and I enjoyed it. I also tried the “Clementine Crush” made with Clementine-infused vodka, orange juice, lime juice and bits of fruits. This was the prettiest but the taste was kind of boring for some reason. I think because the vodka flavor was a bit overwhelmed by all the fruits. There were also sangria and beer making the rounds. 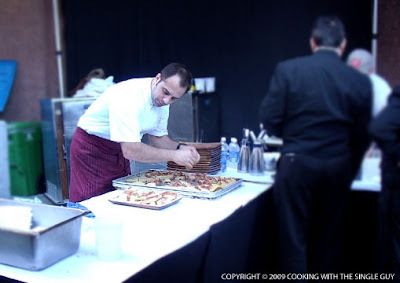 Here’s Chef Corbo hard at work in a makeshift prep area in the back of the restaurant. I think he was a bit surprised when he looked up and I was there snapping away. But when you’ve got two vodka drinks under your belt, you’d be daring too! 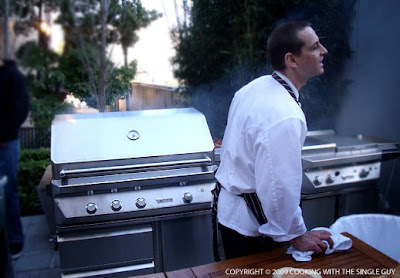 I think this is the chef de cuisine manning the grill, which didn’t serve up anything while I was there. So much for the BBQ. 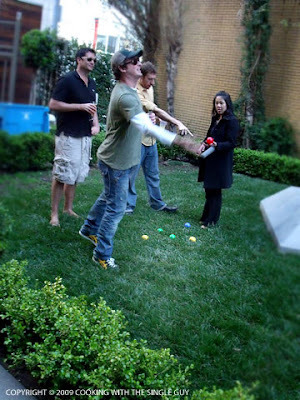 And here were a few friends of the restaurant making an attempt at the “bocce ball” party of the “Bocce Ball and BBQ” event. It never really got going since most of the crowd was into the free drinks and food. Even though I didn’t get any barbeque and the bocce ball game was pretty lame, it was still a fun way to kick off my weekend. Everyone seemed to enjoy hanging out with friends and soaking in the peeks at summer.